Here are some pictures of the prescribed burn that Roger Lewellyn had at his place in February of 2016. He has created an informative 20-minute video about the planning and procedure. 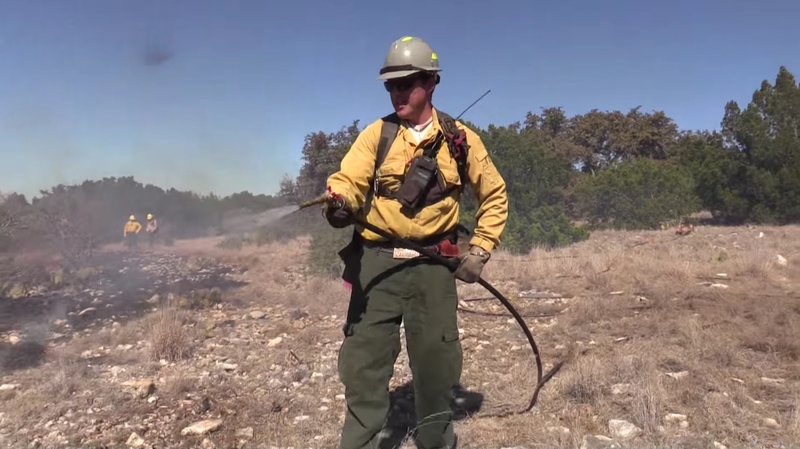 Even those who know something about prescribed burns can pick up a new fact or tip from the video. You can click on the pictures to view a larger version. One of our neighbors, Bob Pauken, has shared this information about building a water guzzler. Bob says that this design may not be easy to copy exactly, because he had access to some recycled materials, and some strong and skilled labor, but we think the information will be useful. If you do a similar project, please let us know! And now, here is Bob’s description. The idea for construction of a guzzler came from discussions with Randy Wood, someone else talking about his at the fall meeting, and seeing the one Gilbert Carmona built on his land. I wasn’t sure exactly how to go about the project so I was discussing the mechanics of it with a friend from Colorado, Rory Birdsey who is a ranch manager for Ernie Cockerl, owner of a ranch on the Taylor River there. One of the guests at the ranch last summer was Andrew Sansom, research professor at Texas State University and author of the book Water in Texas, an Introduction, from the Texas Natural History Guide series. He and Rory had in-length discussions about guzzlers. Rory then went to the internet and designed what he thought would be a working guzzler. 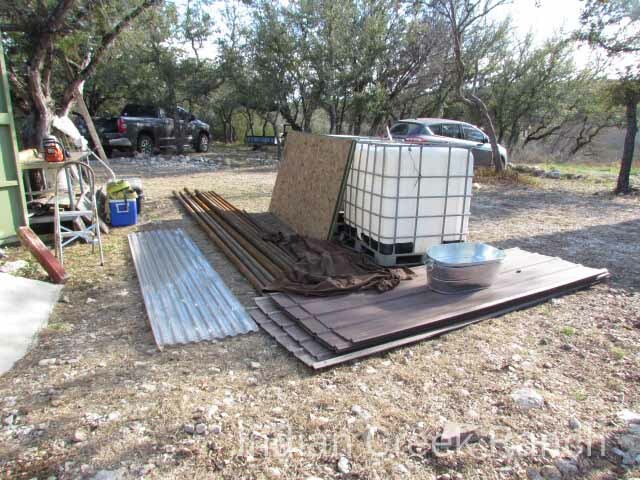 He then set about collecting recyclable cabin metal roofing materials from around the ranch. One of his sons who works in the oil fields of western Colorado gained access to discarded drilling pipe. The materials were cut in Colorado to fit a 19ft. long and 16ft. 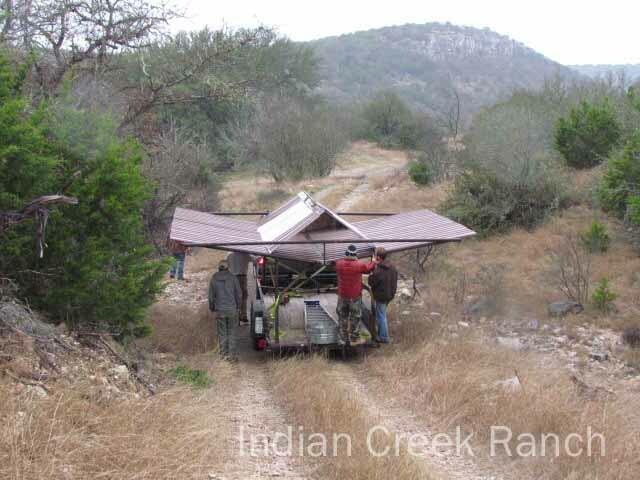 wide structure to be hauled to Indian Creek ranch on a 16ft. trailer. The materials used for the guzzler. The drill pipe was trimmed for welding on our property. Each piece weighed 165lbs. Rory brought both of his sons and the husbands of both of his daughters along with him to handle the weight of the resulting monster. 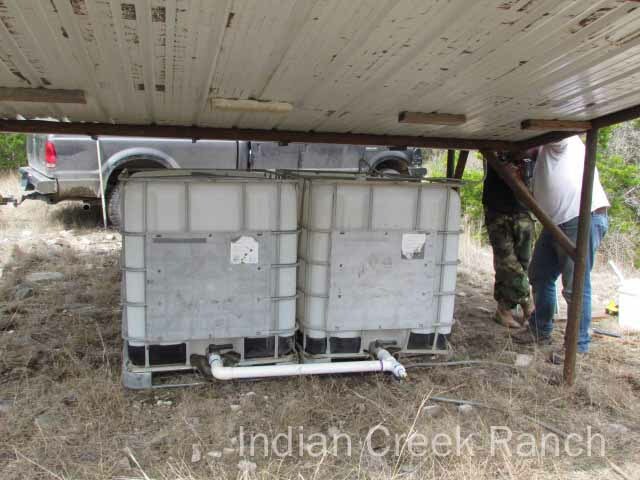 The two-250 gallon water tanks were washed-out and discarded oil field chemical tanks. The roofing materials were riveted and screwed into place to form an inverted roof which drained into a collection trough in the middle. A hose was then connected from the trough to drain into the closest tank and the two were connected together with PVC tubing. From the base of one of the tanks was attached a 75 foot garden hose which ran downhill to a 50 gallon open, metal water tank with a float valve to maintain a full level. Moving the guzzler into place. The large structure is designed to collect rain water. However, inside of the inverted metal roof is an upright smaller structure made mostly of plastic, for collecting dew at night when the air cools-off. Metal sides were attached to the main structure to retain daytime heat, thereby enhancing nighttime condensation. A larger metal water tank for providing a source of drinking-water for the wildlife will be brought down on our next trip. Our calculations of rainwater collection based on 26.5 inches of average annual rainfall for a guzzler of this size is 418 gallons per month. It does work as I had Randy go by and check it following the first 1.5 inches of rain and we had collected about 300 gallons of water. Today the Associated Press published an article entitled, “Texas drought will harm wildlife habitat for years”. As the state struggles with the worst one-year drought in its history, entire ecosystems, from the smallest insects to the largest predators, are struggling for survival. The foundations of their habitats – rivers, springs, creeks, streams and lakes – have turned into dry sand, wet mud, trickling springs or, in the best case, large puddles. 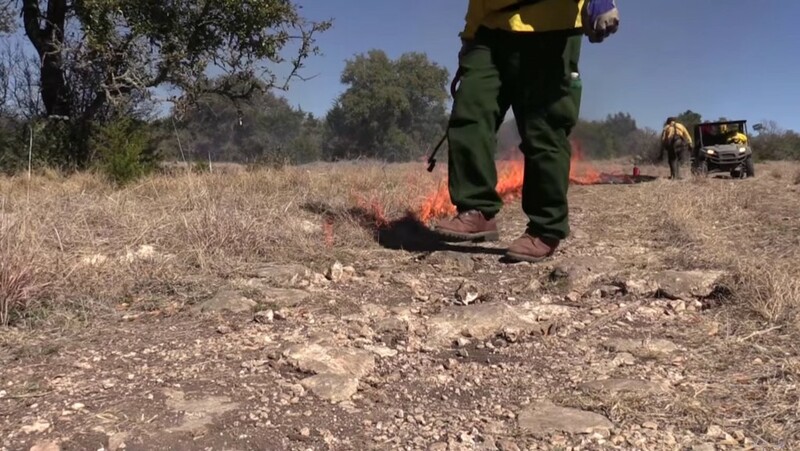 “It has a compound effect on a multitude of species and organisms and habitat types because of the way that it’s chained and linked together,” said Jeff Bonner, a wildlife biologist with the Texas Parks and Wildlife Department. 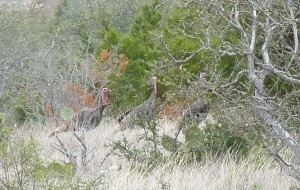 There have been reports in Edwards County of doe abandoning their fawns due to lack of food and water. 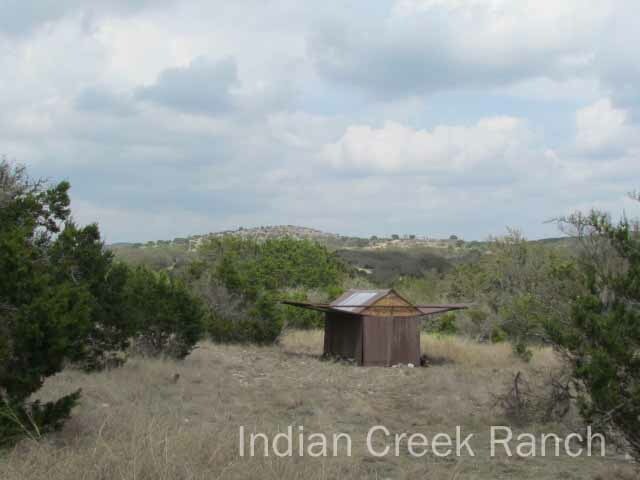 It’s very important for land owners at Indian Creek to make sure that their water toughs are working and that you are putting out the necessary feed to help protect the wildlife of Indian Creek Ranch.